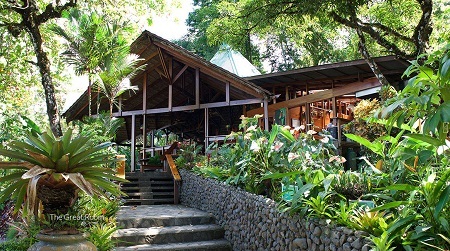 All Inclusive GREENTIQUE HOTEL - Aguila de Osa Rainforest & Marine Adventure Lodge in Osa Peninsula, overlooking Drake Bay, Costa Rica! Bid Per Person Per Night and Choose Your Length of Stay! in Osa Peninsula, Costa Rica! Águila de Osa Rainforest and Marine Adventure Lodge is your gateway to the Osa Peninsula – the last truly wild place in Costa Rica. Nestled in the jungle-covered hillsides overlooking Drake Bay, its beautifully hand-crafted cabinas and stunning Great Room set the highest standards for comfort, exquisite food, and personalized service on the Osa. Offering the most convenient access to Corcovado National Park and Caño Island Biological Marine Reserve, Águila has a full array of adventures, including world-class sportfishing, scuba diving and snorkeling, whale and dolphin watching, as well as birding, hiking, beach trips, river kayaking, mangrove estuary excursions, and more. Come see why Águila de Osa’s lush, tropical setting is the destination of choice for adventurers from around the world. Offer is based on single or double occupancy in a Standard Room Double. Tax and service charges are $49.00 per person per night additional. Stay a minimum of 1 Night and up to 10 Nights as desired and based on availability.